I hope you like my fashion posts because today I have more pretty pictures of clothes to show you. These were drawn in 1814. I love the huge miffs women used to keep their hands warm (I could so use one right now! ), and the evening dress is really nice, but I’m not sure how I feel about the morning dress. It looks like a nightgown, doesn’t it? Let me know what you think of these outfits! A Plain cambric robe, with long gathered sleeve and high arched collar, trimmed with net lace or muslin. A Spanish lappelled coat of fine orange Merino cloth; full epaulette ornaments on the shoulders: the whole lined throughout with white sarsnet, and trimmed with a raised border of white velvet or swansdown. A small, provincial bonnet of the same material as the coat, ornamented with a full curled ostrich feather. White spotted ermine or Chinchilli muff. Gloves grey or light blue kid. Half-boots of orange-coloured jean, or velvet. A round robe of plain jaconot muslin, with spencer bodice, and rounded falling collar, edged with lace or needle-work; the same ornamenting the bottom of the dress. 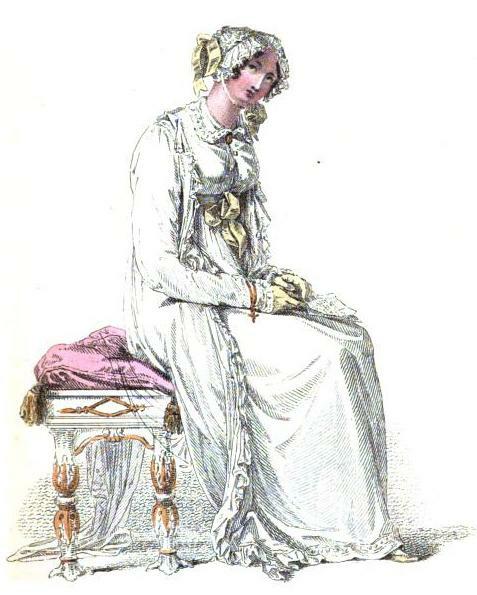 A loose robe pelisse of Indian muslin, thrown quite open in front, trimmed entirely round with a full gathered border of muslin or lace; the back confined at the bottom with a lemon – coloured ribband, brought round the waist, and tied in bows and ends in front. The Flushing mob cap, composed entirely of lace, ornamented with lemon-coloured ribband, which also confines it under the chin. A small rosary and cross of amber, twisted round the wrist, and a broach of the same confining the dress at the throat. Slippers and gloves of lemon-coloured kid. A White crape petticoat, worn over gossamer satin, ornamented at the feet with rows of puckered net, with a centre border of blue satin, or velvet, in puffs. A bodice of blue satin, with short full sleeves,: and cuffs to correspond with the bottom of the dress. A full puckered border of net, or crape, round the bosom. Stomacher and belt of white satin, with pearl or diamond clasp. Hair in dishevelled curls, divided in front of the forehead, and ornamented with clusters of: small variegated flowers; a large transparent Mechlin veil, thrown occasionally over the head, shading the bosom in front, and falling in graceful drapery beneath. Earrings, necklace, and bracelets of Oriental pearl, or white, cornelian. Slippers of white satin, with blue rosettes. White kid gloves; and fan of spangled crape and blue foil. A round high robe, with long full sleeves, of fine cambric; a high, collar, and deep border of needlework round the bottom. 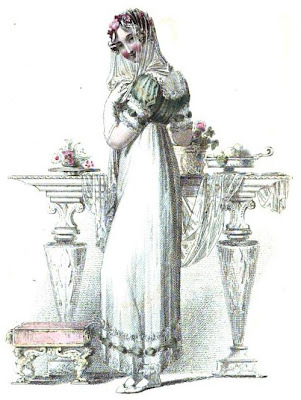 A Russian mantle of pale salmon-coloured cloth, with spencer bodice, lined throughout with white sarsnet, and ornamented with a border of morone velvet and white silk cord; the spencer seamed to correspond, and the mantle confined in front of the bosom with a broach. A small helmet bonnet, composed of the same material as the mantle, lined with morone velvet,and edged with white silk cord, ornamented with a double curled ostrich – feather. Half-boots of pale salmon-coloured kid, edged and laced with morone cord. Gloves of lemon-coloured kid.